Still working on the ‘big’ project mentioned in my previous post. In the meantime I might be posting some Cure in Holland discoveries every now and then. This month a new book about The Cure called ‘A Perfect Dream’ by Ian Gittins was released through publishing company Palazzo. I have not read it yet. Just browsed through it. It looks like a nice, big coffee table kind of reference book. It also contains many beautiful (sometimes full page) photos, some of which I hadn’t seen before. 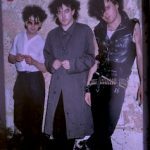 On page 70 there is a great full page picture of The Cure threepiece lineup in 1982 style, posing in front of a map on the wall (snippet on the left/above). I came to look at this map. The outlines of the neighbourhoods looked so familiar. Then I recognised some details and suddenly realised this is the city map of my hometown Utrecht! 😀 On page 83 there is a smaller picture also in front of this map which must be from the same session. Judging from the clothes and the location I suppose they are from the same shoot as the famous sculpture picture, probably on the eve of The Cure’s concert at Muziekcentrum Vredenburg in Utrecht on 10 May 1982. Maybe the pictures in front of the map were taken inside the Holiday Inn hotel? Picture credits: Gentlelook.